Sanitary sewer overflows can be caused by a number of factors. They usually involve sewer pipe blockages in either main sewer lines or service laterals (line between buildings and the main line). Causes may include pipe breaks or cracks due to tree roots, system deterioration, insufficient system capacity due to residential or commercial growth, or construction mishaps. In home and office plumbing systems, the main cause is accumulation of grease, tree roots, hair, or solid materials, such as disposable diapers or sanitary napkins that are too large for wastewater pipes to handle. Such materials may cause major backups in Sanitary Board lines as well as in residents’ lateral lines. A frequent cause of water stoppages within the Sanitary Board’s system, however, is vandalism. We hope you will report observations of any unauthorized access or activity immediately. If the backup occurs in a Sanitary Board maintained line, the wastewater will normally overflow out of the lowest possible opening, which is usually a manhole. However, in some homes – especially those with basements, or where the lowest level is even with the sewer lines – the overflowing wastewater may exit through the home’s lower drains and toilets. •	Keeping in mind that ceramic plumbing fixtures such as toilets are fragile, quickly close all drain openings with stoppers or plugs. Tub, sink, and floor drains may need additional weight to keep them sealed. A string mop can be used to help plug toilet openings. •	Don’t run any water down your drains until the blockage has been cleared. •	A quick check with nearby neighbors will help determine if the backup appears to be in your neighbor’s wastewater line, and/or widespread in your neighborhood. In this case, call the Sanitary Board of Bluefield immediately. Numbers are listed at the end of this flyer and on your monthly sewer bill. •	Call a plumber if the problem is in your lateral service line. If I call the Sanitary Board, what will they do about a sewer backup onto my property? •	You will be asked questions about the backup timing, location, the property at risk, etc. •	Sanitary Board personnel will check for blockages in the main line. If found, the blockage will be immediately cleared. •	To minimize damage and negative health effects, you should arrange for cleanup of the property as soon as possible. There are qualified businesses that specialize in this type of cleanup. •	If the sewer backup onto your property resulted from blockage in the main sewer line, Sanitary Board personnel will explain what the Sanitary Board of Bluefield can immediately do to take care of the problem. Is there anything I can do to prevent sewage backups into my home? •	Avoid putting grease down your garbage disposal or household drain. It can solidify, collect debris and accumulate in Sanitary Board lines, or build up in your own system. •	Never flush disposable diapers, sanitary napkins, wipes or paper towels down the toilet. They could stop up your drains and may damage your plumbing system. 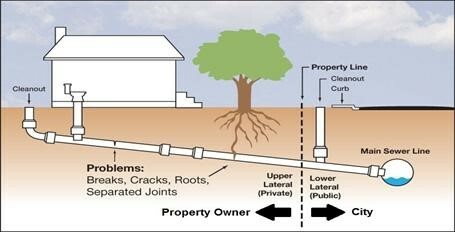 •	If the lateral line in your older home has a jointed pipe system, consider whether the roots of large shrubs or trees near the line could invade and break pipes. It is a good idea to know the location of your lateral line(s). Property maps may show the location of these lines. •	If the lowest level of your home is below ground level, such as a basement floor drain, it may one day be affected by a backup. One way to prevent sewage backup through such below ground areas is to install a “backflow prevention valve” on the lowest drain(s). You can also use a plumber’s test plug to close these drains when not in use. •	For further information about preventive measures, contact a plumber or plumbing supply dealer. What does the Sanitary Board of Bluefield do to prevent this problem? •	Every attempt is made to prevent backups in the public wastewater system before they occur. Sewer lines are specially designed to prevent accumulation and stoppages. •	In addition, we have maintenance crews that are devoted to inspecting and cleaning wastewater lines throughout the Sanitary Board’s system on a regular schedule. •	Degreasing chemicals are also injected into lines in areas that are prone to stoppages, such as those near restaurants, apartments or high density housing developments. •	Even with our maintenance schedule, however, backups are often beyond the Sanitary Board’s control. Most that do occur, are confined to the sewage pipeline, rather than backing up into a home. In the majority of cases, a special rider will need to be added to your homeowner’s or renter’s insurance policy to cover damages related to sewage backups or water damages. This optional coverage is usually not very expensive, but you must usually request that it be added to your policy. Check with your insurance agent about this policy provision. As with the majority of municipalities in the country, the Sanitary Board of Bluefield cannot assume financial responsibility for damages resulting from sewage backups, since most stoppages are related to conditions that are beyond the Sanitary Board’s control. That is why it is very important that property owners confirm that they are adequately insured – particularly if the any areas of their home lie below ground level. Please call your insurance agent today to have this coverage added to your policy.